Animal welfare is a subject that is very close to our hearts. Eden products are tested by (our) animals and not on animals. Our own pets and a small number of pets owned by friends and family try out any new recipes and also eat the food every day. This way we can see the long term benefits a good diet has on health. We have a big testing team and a little testing team, they had their picture taken for you to see! 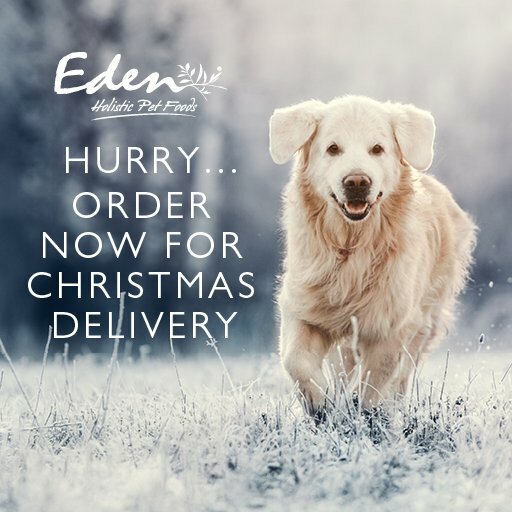 Eden are actively involved in a number of cat and dog charity organisations and run a Facebook group called Eden Angel Rescues, in addition to the Cat and Dog Facebook forums for general help and advice, the forums also great for giving us feedback not only how our food is being received but also in shaping future products. Eden are members of the Pet Food Manufacturers Association (PFMA) and the Pet Industry Federation (PIF) which are leading trade organisations. Although we are only a small company, our aim is to influence and promote animal welfare within the industry. The principle of the Ancestral Diet is that both Cats and Dogs are carnivores, hence to make up the high percentage of meat in our food means that we are also concerned about the welfare of the animals use by our suppliers. We use raw materials which are surplus to the human food chain due to commercial reasons. These ingredients come from animals which, under veterinary supervision, have been passed as fit for human consumption. They are sourced from registered abattoirs whose operations are regulated under veterinary supervision to ensure animal welfare standards are complied with. The principle piece of legislation governing this area is the Council Directive 98/58/EC, on the protection of animals kept for farming purposes which lays down rules for the protection of rabbits kept for food.